Tension and strain in the neck area is a very common complaint. With more and more of us spending so much time sitting this situation will only get worse. Looking at the VDU, ipad and phone is leading to an increase in neck problems, there is even a ‘texters neck syndrome’! 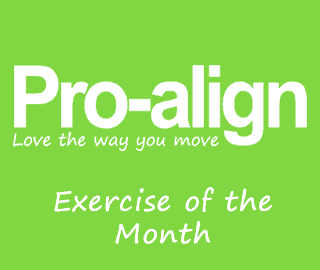 The exercises this month have been picked to address both stretches and openers and then some stability work to strengthen the deep muscles at the front of the neck. ( Very similar to the abdominal core). Sitting and craning at a screen, traffic or the TV can lead these ‘neck core’ muscles to become weak and the more global muscles to overwork and feel tense. The head also then adopts a forward position which can lead to further neck strain and headaches. **The neck is relatively delicate so don’t pull on your head with any of the stretches. Click on the image to see Sal’s Neck Rehab video! Any questions about this program should be directed to Sally Harrison. MyPhysioRehab and Pro-align does not accept any liability for damage or injury suffered whilst performing these exercises. Please seek advice from your health professional if you experience any discomfort during this exercise routine.